This simple Thai chicken soup has that distinctive Thai flavor, a balance of spicy, salty, sweet, and sour. You will especially welcome this soup's warmth during the winter. Tom Ka Gai can either be served as an appetizer or as the star player. Add noodles if you're planning to make this soup an entree. So sip, slurp, and enjoy. Slice and mince the lower portion of the lemongrass stalk. Retain the upper stalk for the soup pot. Place chicken broth in a large soup pot over medium-high heat. If you have leftover chicken or turkey bones, add those too. Bring to a boil. Add fresh chicken, leftover chicken, or turkey, and mushrooms. Then add the prepared lemongrass, including the upper stalk pieces, the kaffir lime leaves, and fresh chilies. Boil 5 to 8 minutes, or until the chicken is cooked. Add the galangal or ginger, 1/2 can of the coconut milk, the fish sauce, and extra vegetables (if using). Stir well and simmer gently for 1 to 2 minutes. Do a taste test. Look for a balance between spicy, sour, salty, and sweet flavors. Start with saltiness, adding more fish sauce if the soup is not salty or flavorful enough, 1 tablespoon at a time. If it's too sour, add the brown sugar. If the soup is too spicy or if you'd like it creamier, add more coconut milk. If it's not spicy enough, add more chilies. Ladle the soup into serving bowls. Sprinkle a little fresh coriander, basil, and spring onions over each bowl. For an extra kick of flavor, add a dollop of either store-bought or homemade Nam Prik Pao chili sauce. 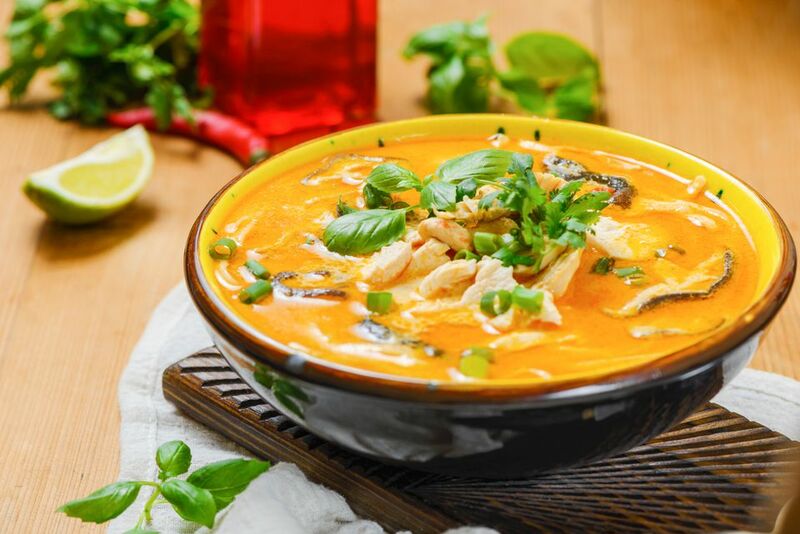 If you are serving the soup with noodles, it is best to prepare them separately from the soup; otherwise, the soup gets too thick because of the starch from the noodles. Leftovers will also taste better this way.